So I am need of a venue for a leisurely lunch as the year draws to a close which sees the shoppers flooding the malls, the Christmas Cards in the mail and countless waitresses in town donning the distinctive Santa hat. I eventually decide the soothing baskets of hot dumplings is the perfect tonic to end a hectic year, so I find myself at Mr. Wong in the city for some lovely Yum Cha. The place looks like a Canton tea house in the middle of Wan Chai (Brings me back fond memories of my recent trip to Hong Kong). So I find a lovely spot and start ordering…. This is such a wonderful start to the afternoon. The beautiful soft succulent prawns are the base of this dish paired with the “melt in your mouth” wheaty wonton wrappers, the burst of salty seafood flavours of the tobiko and of course the tender scallop (gently nestled in between the prawn base and the tobiko) which falls apart on the tongue to deliver an exquisite dumpling taste sensation. The abalone is the star of this dish! The strength of the flavour and smell of the abalone is spectacular and even overpowers the subtle flavours of the crab. The dried shrimp in the wild rice provides some lovely salty flavour while the sticky texture of the rice is a beautiful contrast to the abalone. 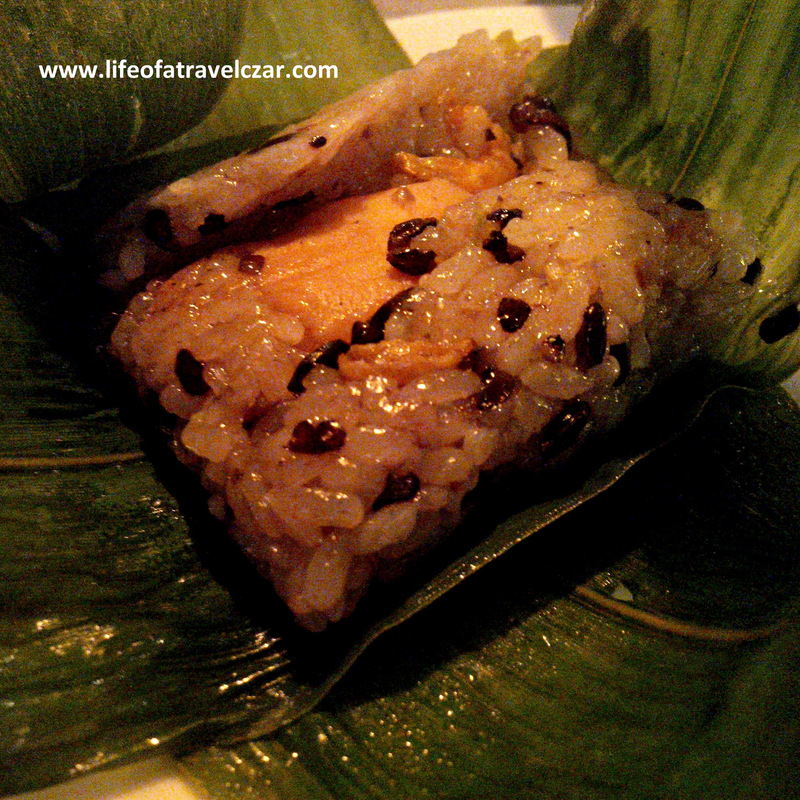 The astethics of the dish is wonderful wrapped in a banana leaf for a nice touch. 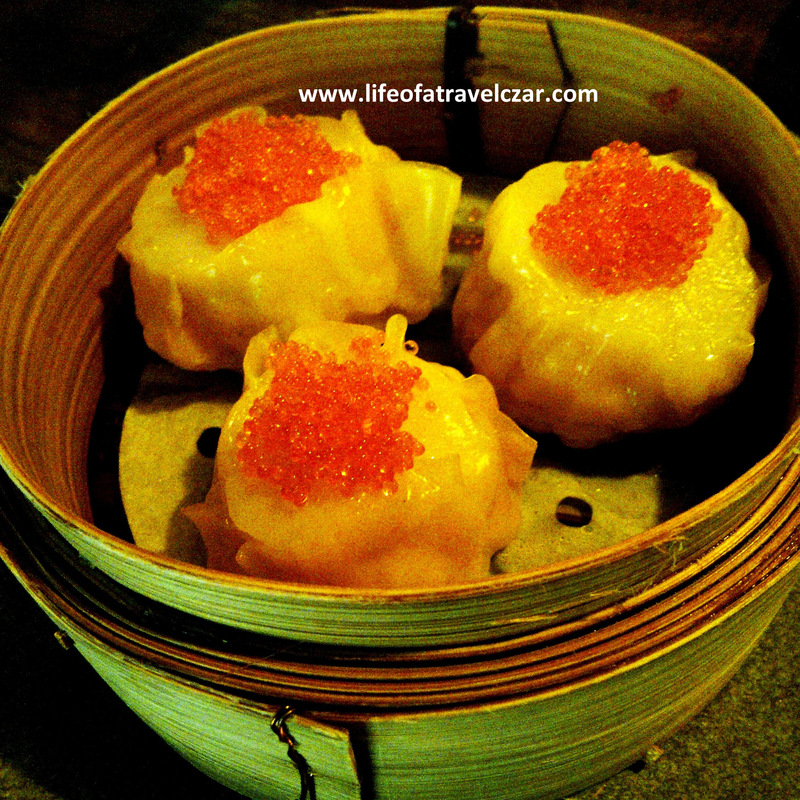 The soft silky casing of the dumpling is the prelude to this interesting dish. The mushrooms and truffles combine to provide a rich fungi earthy filling with the flavour and aroma of the latter delivering its usual stylish flow. 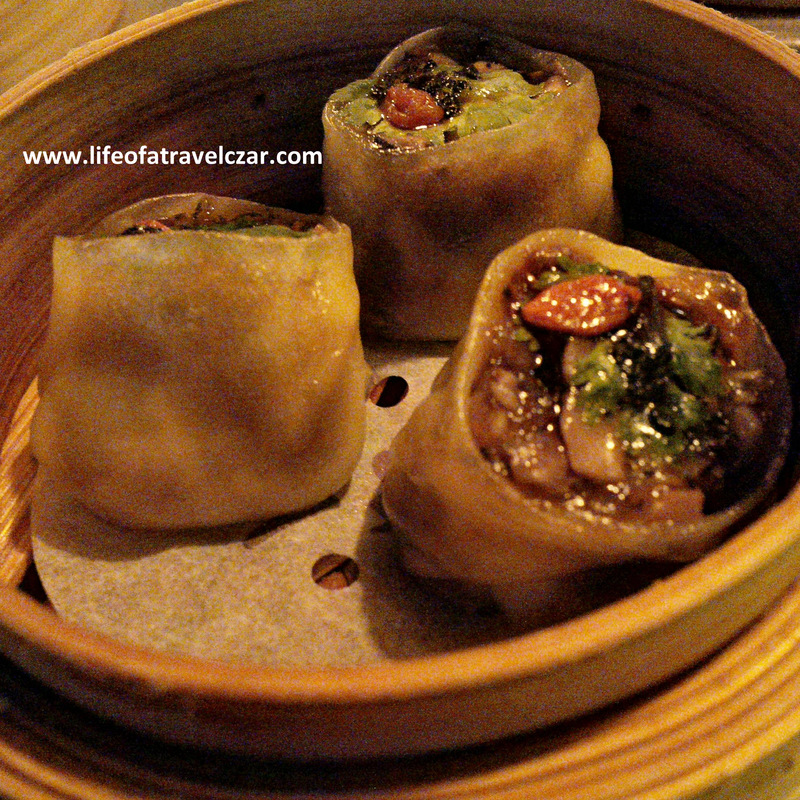 Its a soft stewy filling which is contrasted by some water chestnuts which offer some crunch to the dumpling. 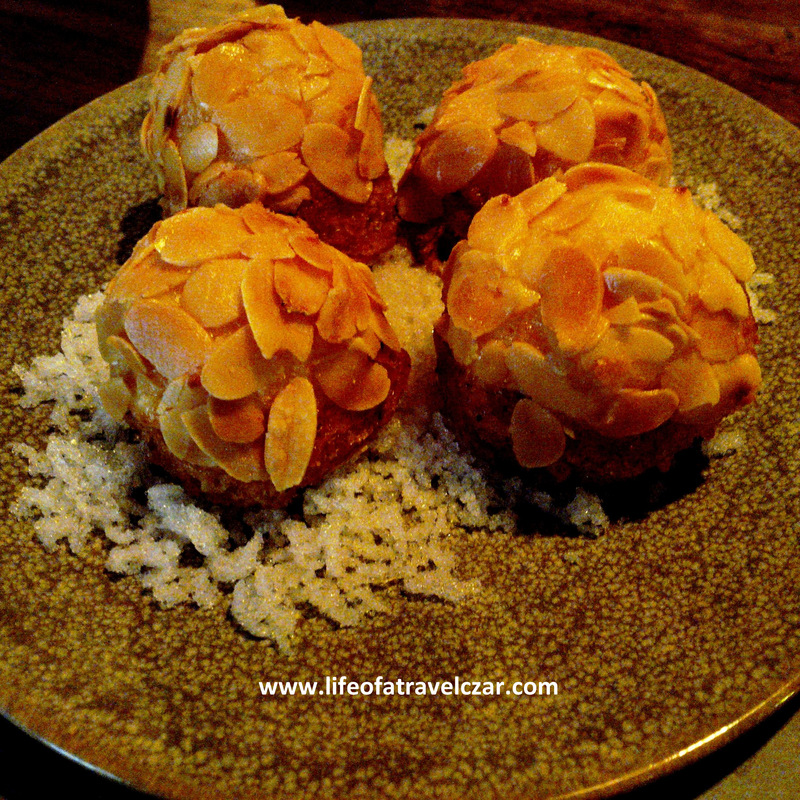 The crunchy almonds coating and toast base are a perfect contrast of textures to the beautiful soft prawn centre. The foie gras and the oil soaked crispy base adds a richness to the dish which is quite unique. Its beautiful but too “super rich” for me. The soft jelly-like wagyu carpaccio is amazing with the full flavour of the wagyu on display. The texture of the beef is contrasted perfectly by the bread croutons. 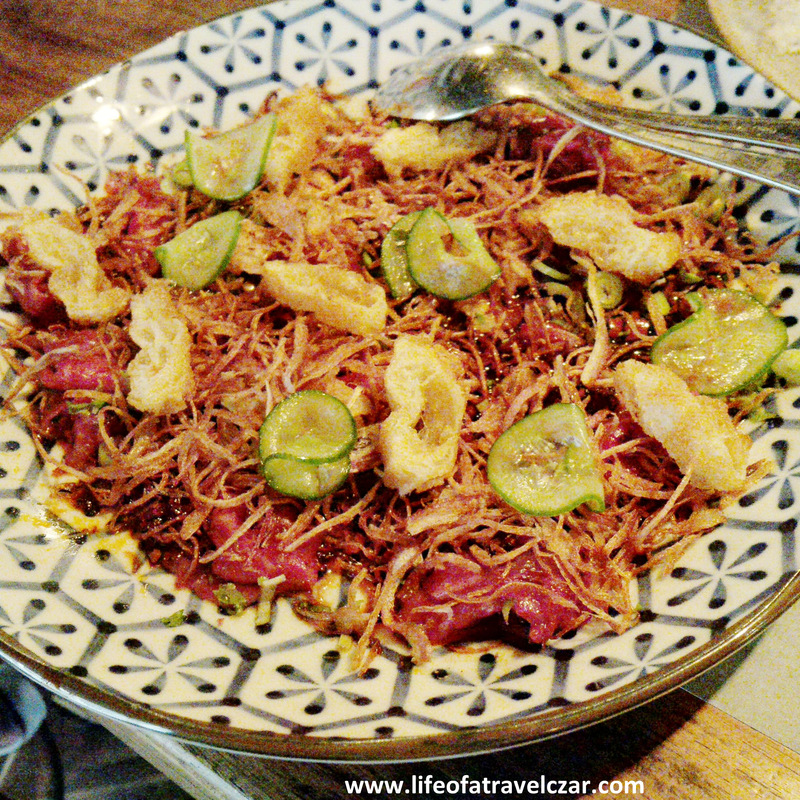 There is a sprinkling of pepper, chilli and spring onions which provide an intense spicy kick to go with the beef while the pickled cucumber adds a lovely tang to the dish. The stringy dried (onions I think as the flavour was hard to discern) added some additional chewy texture overlay to a dish that was driven by the flavours of the seasoning more than the underlying produce itself. I choose the Malbec to accompany the dish. Its soft, juicy with fresh red fruit flavours and a decent body with some lovely hints of spice. Its a nice meaty wine which is easy to drink and offers a calmness in the midst of the chaos of the lunchtime frenzy. The cocktail has Plymouth gin, violet liqueur, lemon juice and lychee sorbet with a hidden cherry at the bottom. The flavour is beautiful with the lovely floral notes of the violet liqueur interacting effortlessly with the botancial characteristics of the gin. 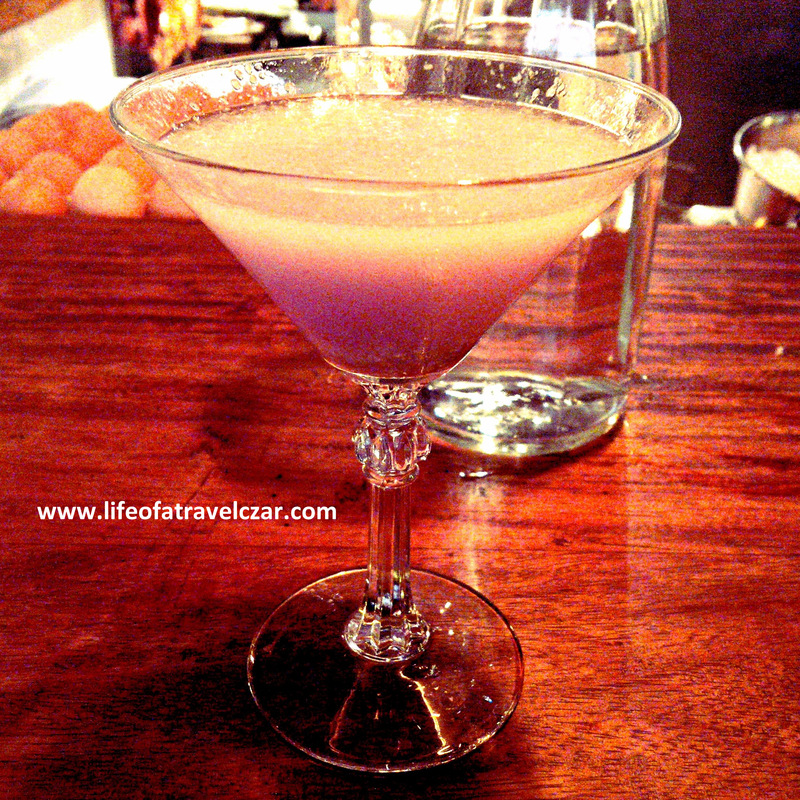 The violet liqueur and lychee sorbet offers a streak of sweetness which dominates the drink. The sweetness is nicely balanced with the citrus bite of the lemon. Then as the drink level lowers… the cherry which has absorbed the cocktail finds itself on my tongue releasing a burst of intense flavours of the violet and gin to close off the afternoon.